Applications for SF6 include gas insulated transmission lines and’gas insulated power distributions. 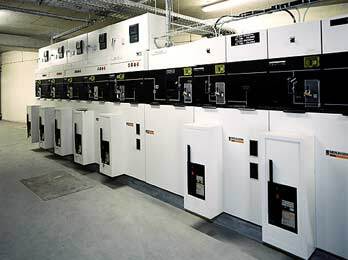 The combined electrical, physical, chemical and thermal properties offer many advantages when used in power switchgears. Toxicity – SF6 is odorless, colorless, tasteless, and nontoxic in its pure state. It can, however, exclude oxy­gen and cause suffocation. If the normal oxygen content of air is re­duced from 21 percent to less than 13 percent, suffocation can occur without warning. Therefore, circuit breaker tanks should be purged out after opening. Toxicity of arc products – Toxic decomposition products are formed when SF6 gas is subjected to an elec­tric arc. The decomposition products are metal fluorides and form a white or tan powder. Toxic gases are also formed which have the characteristic odor of rotten eggs. Do not breathe the vapors remaining in a circuit breaker where arcing or corona dis­charges have occurred in the gas. Evacuate the faulted SF6 gas from the circuit breaker and flush with fresh air before working on the circuit breaker. Physical properties – SF6 is one of the heaviest known gases with a den­sity about five times the density of air under similar conditions. SF6 shows little change in vapor pressure over a wide temperature range and is a soft gas in that it is more compressible dynamically than air. The heat trans­fer coefficient of SF6 is greater than air and its cooling characteristics by convection are about 1.6 times air. Dielectric strength – SF6 has a di­electric strength about three times that of air at one atmosphere pressure for a given electrode spacing. The dielectric strength increases with increasing pressure; and at three atmospheres, the dielectric strength is roughly equivalent to transformer oil. The heaters for SF6 in circuit breakers are required to keep the gas from liquefying because, as the gas liquifies, the pressure drops, lowering the dielectric strength. The exact dielectric strength, as compared to air, varies with electrical configuration, electrode spacing, and electrode configuration. Arc quenching – SF6 is approxi­mately 100 times more effective than air in quenching spurious arcing. SF6 also has a high thermal heat capacity that can absorb the energy of the arc without much of a temperature rise. Electrical arc breakdown – Because of the arc-quenching ability of SF6, corona and arcing in SF6 does not occur until way past the voltage level of onset of corona and arcing in air. SF6 will slowly decompose when ex­posed to continuous corona. All SF6 breakdown or arc products are toxic. Normal circuit breaker operation produces small quantities of arc products during current interruption which normally recombine to SF6. Arc products which do not recombine, or which combine with any oxygen or moisture present, are normally re­moved by the molecular sieve filter material within the circuit breaker. The procedures for handling nonfaulted SF6 are well covered in manufacturer’s instruction books. These procedures normally consist of removing the SF6 from the circuit breaker, filtering and storing it in a gas cart as a liquid, and transferring it back to the circuit breaker after the circuit breaker maintenance has been performed. No special dress or precautions are required when handling nonfaulted SF6. Solid arc products - Solid arc products are toxic and are a white or off-white, ashlike powder. Contact with the skin may cause an irritation or possible painful fluoride burn. If solid arc products come in contact with the skin, wash immediately with a large amount of water. If water is not available, vacuum off arc products with a vacuum cleaner. Respirator – A cartridge, dust-type respirator is required when entering an internally faulted dead-tank circuit breaker. The respirator will remove solid arc products from air breathed, but it does not supply oxygen so it must only be used when there is sufficient oxygen to support life. The filter and cartridge should be changed when an odor is sensed through the respirator. The use of respirators is optional for work on circuit breakers whose in­ terrupter units are not large enough for a man to enter and the units are well ventilated. well explained infomation about SF6 and Vacuum circuit breakers. Your notes on SF6 gas have been very educative.My employer has a lot of circuit breakers and as a maintenace staff i would talk to my colleages about what i have read on your site. Sir can you provide me the list of manufactures of SF6 GENERATOR CIRCUIT BREAKER. Sulfur Hexafluoride (SF6) is an excellent gaseous dielectric for high voltage power applications. It has been used extensively in high voltage circuit breakers and other switchgears employed by the power industry….